Find out how former Viva Hot Babe Andrea del Rosario started her entrepreneurial journey through a specialty restaurant that serves different kinds of longganisa. Actress Andrea del Rosario knew one thing: she wanted to get into the food business. And she believed she had a good idea. “I used to travel around the Philippines because I’d do shows, perform at fiestas, stuff like that. And I’d never go home without longganisa from the towns I visit,” the former Viva Hot Babe reveals. 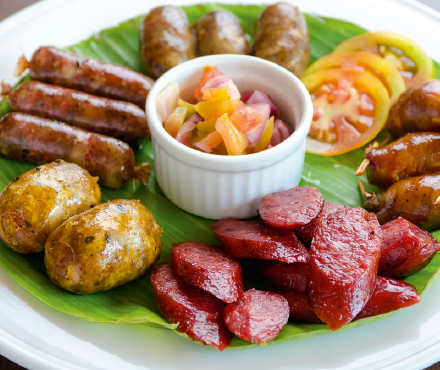 Longganisa is the Filipino version of the Spanish chorizo, a pork sausage flavored with any combination of garlic, pepper and other spices. Observing that longganisa platters were served in restaurants as a pulutan option to beer, del Rosario thought that there was a market for eateries that specialize in longganisa—especially since there are many varieties from all over the country. So with a high school classmate who has a hotel and restaurant management degree and another schoolmate who had become a chef, del Rosario launched Longganisa Sorpresa with about P4 million in start-up capital. “We carry 12 kinds of longganisa,” del Rosario says. When their flagship restaurant at the SM City North EDSA mall (now at Sky Garden in the same mall) opened in 2011, its menu boasted of the different ways longganisa could be incorporated in several dishes. The menu has since been revised to include more value-for-money meals. While interesting specialties such as Mangga Vigan Ensalada, Chick-an Wings, Kapampangang Callos and Binagoongang Liempo draw the eye, the longsilog (longganisa, sinangag or fried rice, and pritong itlog or fried egg) value meals (a choice of one of the 12 longganisa varieties) are the bestsellers, selling (still) at P99 with a free iced tea. Its come-on is undoubtedly its authentic longganisa varieties (Alaminos, Baguio, Cabanatuan, Cagayan, Calumpit, Cebu, Davao, General Santos, Laoag, Lucban, Tuguegarao, Vigan), but the restaurant also has six kinds of local vinegar to enhance the taste and flavors of their main dishes. Longganisa Sorpresa has since opened its second branch in the residential and office neighborhood of Kapitolyo, Pasig City.